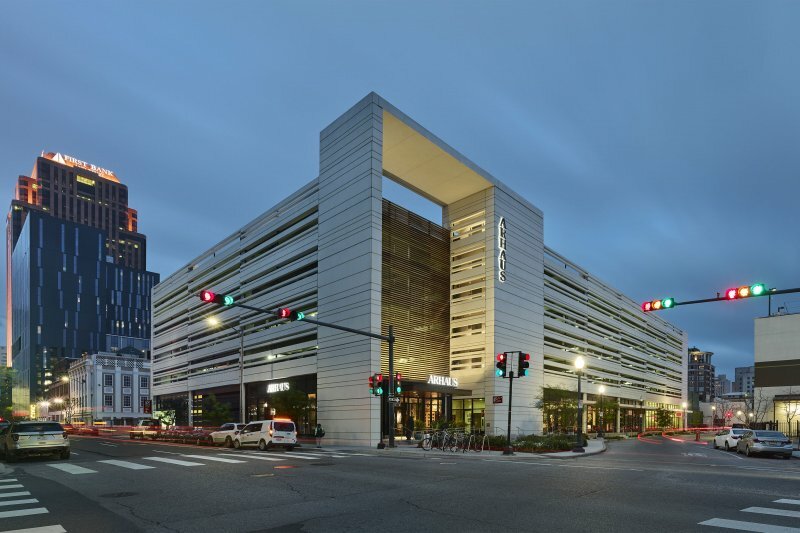 The Park at South Market is a six-story hybrid structure, which merges a 441-space parking garage with 27,000-square-feet of street-level retail. Located in the booming Warehouse District of downtown New Orleans, The Park captures the aesthetic rigor of the existing 19th century warehouses, while rethinking a typically unremarkable building typology and its construction methods. At 205,000-square-feet, The Park supports an evolving hub of urban activity, while tastefully preserving the style of the surrounding neighborhood. 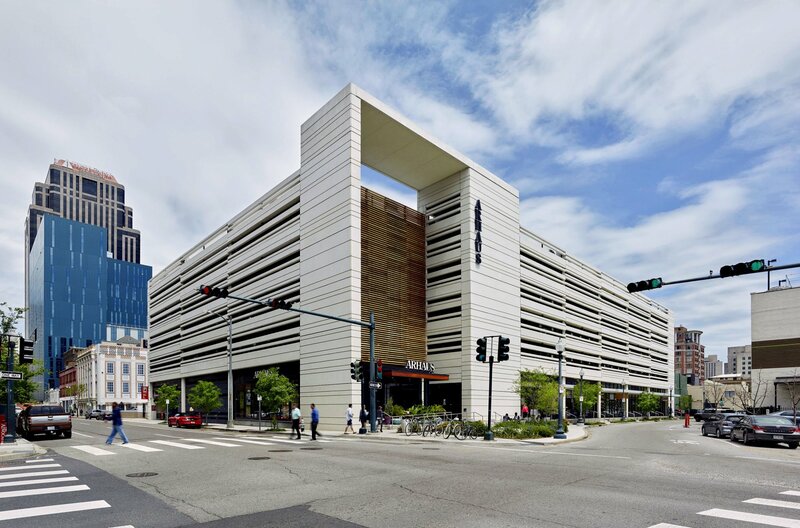 Of immediate importance was the notion that a parking garage could defy expectations, and serve as a beautiful aesthetic presence in a dense urban environment. In replacing what was previously large swathes of surface parking, the team worked to develop how the building could gracefully meet the ground, with a concept that blended seemingly disparate notions: lightness and weight. Whereas traditional parking garages assume a monolithic aesthetic, The Park integrates large, pre-manufactured modules that play with pattern and material to visually lighten the building’s facade. Composed of various widths of solid concrete and open-air gaps, the design results in a playful arrangement that defies the typical heavy grid of most garages, while still meeting the 50% open-air façade requirements for naturally ventilated parking structures. 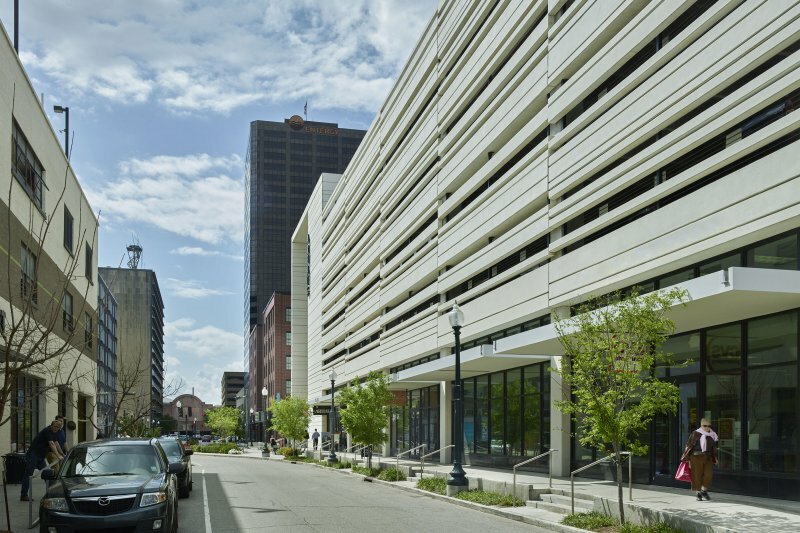 Using a precast construction method rather than a cast-in-place approach, meant that the garage could be built with less street disturbance, greater cost efficiency, and within a much shorter timeframe. The design employs three pre-cast, integrally-colored modules—parapet panels, structural beams, and exterior panels—with five variations for each. At the main entrance, visitors experience a change in material from the industrial concrete of the arcade and marquee, to the softer, natural hardwood (ipe) screen which aligns with the entry. This marks the symbolic shift from the “vehicular” to the “pedestrian” as patrons transition from the garage to the street.